Last week I received word that a short comic I did with Rick Marcks (line art & letters) and GIO (colors) will be appearing in Steampunk Originals Volume 5. Our piece is an eight page story called The Auction featuring a group of Victorian psychic soldiers called the B.R.A.S.S. Lions. The B.R.A.S.S. Lions have been running around my mind for a few years now, so when the opportunity arose to bring this crew to life on paper I was extremely excited. The project worked out so well that Rick and I will be doing some more B.R.A.S.S. 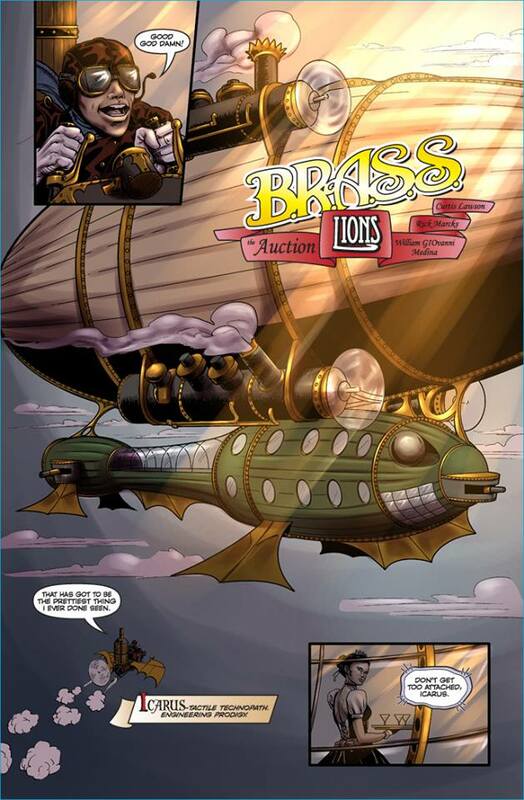 Lions stories down the road and may be submitting one to Steampunk Originals Volume 6, depending on Rick’s schedule. Here’s a sample of the comic! Below are a few character sketches that I had commissioned Tim Tyler to do a while back. You’ll see when the comic comes out that the characters evolved a bit from these early images to what Rick would finalize. “Icarus” concept art by Tim Tyler. Look for Steampunk Originals Volume 5 in the November, 2014 edition of Previews! This entry was posted in Uncategorized and tagged brass lions, comics, steampunk, upcoming. Bookmark the permalink.